Today, channel marketing veterans Peter Thomas and Mike Moore introduce “Marketing Multiplied: A real-world guide to Channel Marketing for beginners, practitioners, and executives,” the industry’s first comprehensive guide to indirect marketing. Building on more than 40 years of combined experience, Thomas and Moore have catalogued the skills and best practices that are key to building a successful channel marketing program. Topics covered include how best to engage partners, how to create programs that generate outcomes, and how to develop the right type of content that will generate measurable results. 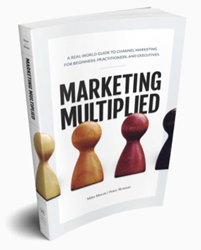 “Marketing Multiplied” is now available on Amazon and BarnesAndNoble.com. For more information, please visit https://marketingmultiplied-book.com/. “Marketing Multiplied” blends practical frameworks and real-world examples from Moore and Thomas’ experience running Averetek, the world’s largest provider of channel marketing automation software. In the book, the authors renounce the “random acts of marketing” approach and provide readers with a clear understanding of the four pillars of a successful channel program: Marketing to, with, through, and for channel partners. By understanding these approaches, readers will discover strategies and tactics that will evolve their channel partnerships into high-performing programs. Thomas and Moore’s and approach distills channel marketing into distinctive, digestible pieces, providing readers with strategies to get the support needed from their leadership team and the results they want from their channel partners. By orienting channel efforts around a modern marketing strategy, all professionals - regardless of skill level - can create programs that effectively address their business objectives.